In 2009, the United States announced a civilian surge to provinces across Afghanistan, sending thousands of U.S. civilian representatives from 2009 to 2014 from agencies including the U.S. Department of State; the U.S. Agency for International Development, or USAID; the U.S. Department of Justice; the U.S. Department of Agriculture; and others. These civilian representatives expanded on the already several hundred U.S. civilian representatives who had worked across Afghanistan since 2002 as part of the U.S. Provincial Reconstruction Teams, or PRTs. This surge deployment to Afghanistan—which saw the largest surge of civilian representatives in U.S. history—built off several previous deployments throughout U.S. history, including in Vietnam in the 1960s and immediately prior in Iraq in 2006. In these particular conflicts where the U.S. government has concluded that there is “no purely military solution,” U.S. policymakers have justified the deployment of civilian representatives as capable of addressing the political and economic drivers of a conflict. In turn, this justification has heightened expectations that civilian representatives can and will resolve the deeply complex, long-term political, social, and economic needs driving conflict. If history is any indicator, the United States may again consider deploying civilian representatives to conflict zones, perhaps to provide U.S. support in Syria, Yemen, or other countries transitioning from conflict. Feedback from these past civilian deployments, however, has often been absent from decision-making. The unique opportunity offered by the recent withdrawal of most civilian representatives from Afghanistan’s provinces provides a critical moment to take stock quantitatively and qualitatively of civilian representatives as a foreign policy tool. The results from civilian representatives’ most recent and largest deployment in Afghanistan show a mixed record of achievements. Overall, civilian representatives generally achieved small albeit significant changes in confined areas—a functioning school, a capable bureaucrat—but not systemic changes that established self-sufficient systems of governance, economic growth, or social development, all of which underpin security in Afghanistan. Perhaps more concerning is that the sustainability of the political and economic changes that civilian representatives supported in Afghanistan remains in doubt. Recent polling suggests that many of the issues that U.S. civilian representatives sought to improve remain nascent: Improving but still low levels of public confidence in the Afghan government, increasing concern over employment and economic opportunity, and a growing sense of insecurity about—and actual increases in—insurgent attacks continue to plague Afghans. If the United States considers a role for civilian representatives in future efforts, policymakers must have a better understanding of what civilian representatives can and cannot achieve; how they can support U.S. national security; and what, if anything, the United States can do to enhance their effectiveness. This report outlines the results from a qualitative and quantitative review of the U.S. civilian representative effort in Afghanistan, in which more than 2,000 civilians deployed from 2002 through 2014. First, the report identifies the objectives that the civilian representatives were charged with achieving. Second, the report evaluates civilian representatives’ successes and failures against those objectives, discusses overall findings, and offers recommendations to guide future deployments of civilian representatives in conflict zones. Afghanistan is the most recent case study for the deployment of U.S. civilians, as well as the largest, providing an illustrative example for any future conflict. Afghanistan, however, remains in conflict, limiting research access and leaving significant questions for the future. To compensate for the difficulty in accessing locations in Afghanistan, the authors conducted an online survey and interviews, both in person and by phone, with U.S. civilian representatives and past and present Afghan officials. These interviews and survey results rely on self-reporting by U.S. civilian representatives and Afghan officials; as such, the research team compared these results with secondary-source data about Afghanistan’s development, security, and political expectations. Data collected from civilian representatives and their Afghan counterparts reveal a fundamental misalignment between the objectives set out for civilian representatives and the tools—whether policy, financial, or bureaucratic—provided to achieve those objectives. Frustration among many of those surveyed reflected this misalignment; one civilian representative described the mismatch between his objectives and his resources as “set up to fail.” While this report does not find that U.S. policymakers intentionally undersupported civilian representatives, it does find that policymakers underappreciated the misalignment between civilians’ objectives and their tactical support. In the short term, civilian representatives in Afghanistan played a critical role in reducing grievances that fueled local conflicts in the provinces and districts where they were deployed. 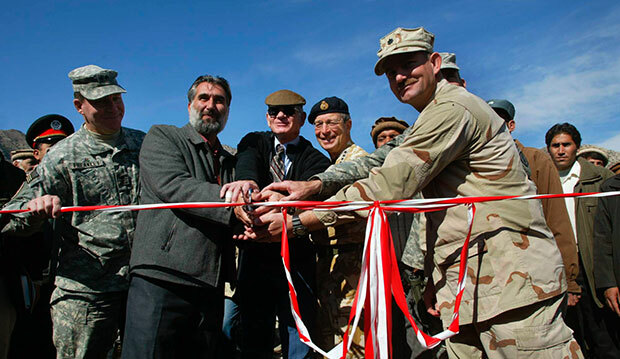 Reconstruction projects developed by civilian representatives often encouraged communities to resolve local disputes, reducing grievances that the Taliban could exploit. With the civilian surge in 2009, civilian representatives took on a greater role in advising the U.S. military. Kael Weston, a former civilian representative in Afghanistan, described the civilian role in 2013 as showing Afghans “that the Americans were not just a military force, that we were a partner that [the Afghans] wanted to keep over the long term.” Indeed, other empirical studies conducted throughout the surge period have shown that these short-term relationships and reconstruction projects were integral to reducing short-term grievances. These successes, however, do not appear to have produced sustainable, nationwide progress, potentially undermining the utility of the civilian representatives as well as longer-term U.S. objectives in Afghanistan. Afghanistan’s trajectory is still unfolding, but among both Afghans and Americans there is a palpable sense of disappointment about what the civilian surge achieved. The sense of disappointment stems from the deep political, economic, and social challenges in Afghanistan after three decades of war, as well as a U.S. approach that provided insufficient or inappropriate resources to fundamentally address those challenges. Combined, the report’s findings from Afghanistan provide a clearer picture of what civilian representatives in Afghanistan and future conflicts can and should be expected to achieve for U.S. policy. In light of these findings, the report offers several recommendations for future deployments of civilians, including: prioritizing objectives; evaluating and re-evaluating assumptions about local environments; investing in people, both in the United States and in the region; acknowledging the full span of resources and risk mitigation efforts needed; improving and expanding the policy feedback loop; and, finally, rethinking evaluation at all levels. One fundamental lesson, however, underpins all of the recommendations for U.S. policy in future deployments: U.S. agencies must do the upfront work of acknowledging and defining the strategic rationale and purpose for civilian representatives in a particular conflict. This report does not evaluate the merits of U.S. strategy in Afghanistan; rather, it examines the lack of prioritized and achievable objectives for civilian representatives within that strategy. Its conclusion—that civilians’ work often created pockets of success that were ultimately undermined because they were not connected to larger, systemic political and economic shifts—is a caution to future policymakers. To create nationwide, systemic shifts, civilian representatives in Afghanistan needed to be incorporated into nationwide efforts that linked their work with the Afghan national government. Instead, they were left to develop their own localized plans with limited resources, even as policymakers articulated publicly much broader objectives for Afghanistan’s future. Ariella Viehe is a former Council on Foreign Relations Fellow with the National Security and International Policy team at the Center for American Progress. Jasmine Afshar is a former National Security and International Policy intern at the Center. Tamana Heela served as a translator for this project.